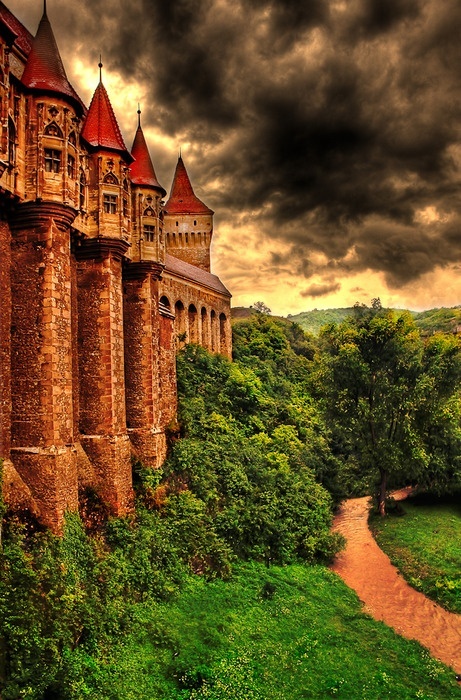 Corvin Castle, also known as Corvins' Castle, Hunyad Castle or Hunedoara Castle, is a Gothic-Renaissance castle in Hunedoara (Transylvania), Romania. As one of the most important properties of John Hunyadi, the castle was transformed during his reign. It became a sumptuous home, not only a strategically enforced point. With the passing of the years, the masters of the castle had modified its look, adding towers, halls and guest rooms. The gallery and the keep - the last defense tower (called "Neboisa" which means "Not afraid" in Serbian language), which remained unchanged from John Hunyadi's time, and the Capistrano Tower (named after the saint, Franciscan monk from the Battle of Belgrade in 1456) are some of the most significant parts of the construction. Other significant parts of the building are the Knights' Hall (a great reception hall), the Club Tower, the White bastion, which served as a food storage room, and the Diet Hall, on whose walls medallions are painted (among them there are the portraits of Matei Basarab, ruler from Wallachia, and Vasile Lupu, ruler of Moldavia). In the wing of the castle called the Mantle, a painting can be seen which portrays the legend of the raven from which the name of the descendants of John Hunyadi, Corvinus came.